Strange how priorities differ, depending on one’s credentials. India can, at best, be satisfied to have won the first Test against the West Indies at the Ferozshah Kotla here in three-and-a-half days, while the visitors can almost be happy that things went that far. The Ferozshah Kotla pitch isn’t good or bad - it’s just the Ferozshah Kotla track. Much castigated over the last four days for its apparent unplayable qualities, the pitch got a little bit of a left-handed compliment from India skipper Mahendra Singh Dhoni at the end of the first Test against the West Indies. There is no end to the miseries of Indian kabaddi players as the B samples of 10 players out of 20, who had tested positive for banned substances during the dope tests conducted by the National Anti-Doping Agency (NADA), have been found positive. It was a cakewalk for Pakistan today. The adept team, apart from registering a one-sided win against Argentina, grabbed much attention and a rousing response in the match. They registered their third victory, beating first-timers, Argentina 82-11 during the World Kabaddi Cup matches held at Guru Nanak Stadium here this afternoon. Sharmila Nicollet and Smriti Mehra shared the opening day honours as they shot one-over 72 each for a two-shot lead in the seventh leg of the Hero Women's Professional Golf Tour. Sharmila and Smriti, who are perched on top of the Order of Merit in the Hero WPGT, have two-shot lead over Ankita Tiwana (74). Nalini Singh, Neha Tripathi and Preetinder Kaur were tied for fourth at 75 each and one shot behind them was Saaniya Sharma at 76. Academy of Golf, Chandigarh Golf Club will be conducting a special putting session for juniors and sub-juniors of members and non-members on Saturday (November 12) from 3.30 pm to 5 pm at the Chandigarh Golf Club practise putting green. The ambitious World Series Hockey (WSH), to be hosted by the Indian Hockey Federation (IHF), suffered a major setback when the Sports Authority of India (SAI) informed the Sports Ministry that the players who would be attending the National camps for the Olympic qualifying tournament will not be released for WSH. Australian captain Michael Clarke hit an aggressive half-century as his team fought back after a poor start on the first day of the first Test against South Africa at Newlands here today. For the records, India won the Test by five wickets here today. Chasing a winning target of 276, reached the target 32 minutes after lunch on Day Four for the loss of five wickets. Also for the records, Sachin Tendulkar did not get his 100th century. But he did enough, as had Virender Sehwag yesterday and Rahul Dravid and VVS Laxman today, to ensure that there was no repeat of the first-innings flop show, as India ultimately coasted to a win, a few reverses notwithstanding. Resuming at 152 for two this morning, it was evident that there would at least an attempt on Tendulkar’s part to get to this coveted and equally elusive milestone. He began promisingly and seemingly had the tacit support of the other batsmen to get the runs. Not out on 30 overnight, getting 70 runs out of the 124 left to chase wasn’t going to be easy, though it looked on for a while. The West Indies could do only one thing - see if they could get early wickets. 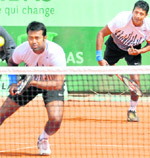 They did come up with a couple of successes, but they were not rapid enough in sequence to upset the Indian momentum. Rahul Dravid fell to the ball of the match when Fidel Edwards’ reverse swing and vicious off-cut brought the ball back prodigiously to shatter the batsman’s furniture, a delivery too good even for Dravid. Or possibly the placed pitch had lulled him a bit. 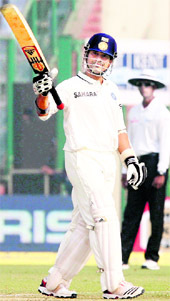 Nevertheless, things continued their merry way for India and Tendulkar and Laxman then got about getting the runs. Their 71-run fourth-wicket stand more or less decided the issue. The other issue of Tendulkar’s century was left for other days when his attempted pull of Devendra Bishoo left him stranded leg-before. The leg-spinner, whose cricketing hero was now also his victim, would have been mighty pleased. Laxman and Yuvraj Singh then put up 42 runs more and when the latter was bowled round his legs, the scores were tied and it was all over for the visitors. But while they lost, the West Indies gave a pretty good account of themselves. For one, had India batted with anywhere close to their potential, they would have played their first innings for close to two days. But they were dismissed in less than four hours, one reason why the Test never saw the fifth day. Similarly, there was a time yesterday when it looked like the match would be over in three days, before the West Indian lynchpin Shivnarine Chanderpaul and skipper Darren Sammy, with the tail, made sure India had to bat well to get the runs. In fact, if the West Indies had one more bowler, a Kemar Roach or someone, in the line-up, India may well have struggled in both innings. Conjectures aside, India can’t possibly begin to imagine this batting was anywhere near their best. The first over was a disaster, while even in the second, three of the five wickets fell to poor shot selection. This series is often being seen as a trial for things to come in Australia. There, such mistakes will be fatal. The bowling, on the other hand, has found more able hands in the spin department, though the fast bowling section could well become a cause for concern in the near future. Sure, there are enough incumbents, but they haven’t been really blooded. They better also get their act together before the visit Down Under. The West Indies will needs to work on batting and bowling equally. But they can pride themselves at being fighters. Some more fight should be expected in the series. The win was recorded but it wasn’t perfect. The batting had left something to be desired, the skipper observed. “If we had got the first-innings lead, then I would have thought it was a perfect way to start the series. We lacked a few things when we batted first but nothing really we can pin-point about that,” he said. “There was not much turn, more than twenty wickets fell even before the start of the fourth day and the batsmen from both sides will feel maybe we could have played better. The skipper was however non-committal on Harbhajan Singh’s prospects or whether he would come back into the side. “Let us see because Ashwin has played one game. Ojha has done well. Let us see how it goes,” was his response. NADA Director-General Rahul Bhatnagar said that the B samples of 10 Indian players were found positive and they have been issued orders to appear before NADA’s Anti-Doping Disciplinary Panel. “After their A samples were found positive, we asked them to get the B samples done. While 10 of them got the B samples done, the other 10 had written a letter stating that we could investigate their B samples on our own,” he added. The names of players whose B samples have been found positive are Karamjeet Singh (Sangrur), Jagsir Singh Chohan (Bathinda), Gurdarshan Singh (Moga), Nirvair Singh (Muktsar), Sukhjit Singh (Kapurthala), Balbir Singh (Amritsar), Kirandeep Singh (Bathinda), Surender Kumar (Jind, Haryana), Sandeep Singh and Jasdeep Singh (both Kapurthala). Bhatnagar further said that as of now, all these players have been banned from participation in any national or international tournament. NADA had collected a total of 51 samples before the Kabaddi World Cup and deposited them in the National Dope Testing Laboratory (NDTL) on October 6. After 20 of them were found positive, the Punjab Sports Department banned their participation in the Cup and debarred them from the Indian training camp. Meanwhile, as many as six foreign players, including two from Canada, two from USA and two from Norway have been found positive for banned substances today. With this, the count has now gone up to 18. It was a cakewalk for Pakistan today. The adept team, apart from registering a one-sided win against Argentina, grabbed much attention and a rousing response in the match. They registered their third victory, beating first-timers, Argentina 82-11 during the World Kabaddi Cup matches held at Guru Nanak Stadium here this afternoon. The Pakistani raiders, Imtiaz Alam, Ishfaq Pathan and Kasif Riaz, scored 10 points each to lead the team to victory while Asif Ali and Mohammad Munsha and Asif Ali Maula both stoppers earned eight points each. For Argentina, Yury Mayor, despite being a first-timer, managed to score seven points. While Norway and Italy too put up impressive shows of strength, trouncing Sri Lanka and Spain respectively. The pace of the first match was dull as few spectators turned out for it. But no sooner the second match between Pakistan and Argentina was announced, people thronged the stadium, welcoming the Pakistan players in typical Punjabi slangs, giving it a complete rustic feeling. Even the Pakistani players responded to the spectator’s gusto and zeal by gripping the Argentina players, ensuring an easy win for their team. In the second match of the day, the robust Punjabi boys from Norway proved their mettle by trouncing Sri Lanka 63-24. Norway took control of the game right from the outset and created a huge margin for their rivals to chase. Kamaljit Singh Soni and Harjinder Singh Jindu scored 16 and 10 points respectively. In the third match, Italy beat Spain with a margin of 52-31. Earlier in the day, Deputy Chief Minister Sukhbir Singh Badal accompanied by Mohammad Aliabadi, Deputy to the Vice-President of Iran, said that apart from the delegation of Iran, the coming days would also see delegates from Canada and Pakistan making it to the World Kabaddi Cup matches. Sharmila, who won the sixth leg six weeks, had two birdies and three bogeys on the front stretch and nine straight pars on the back nine for her 72. Smriti had two birdies each on the front and back nines and also had five bogeys. She began with a double bogey and then bogeyed the third, too, and with a birdie on second, she was two over after three holes. According to Arjuna Awardee Harmeet Kahlon, who is also the director of the academy, world famous Sam Putt Lab putting technology shall be demonstrated and explained in detail to the children. The session shall be free of cost for all participants and is the part of the Comprehensive Coaching Program of the Academy of Golf, which covers technical, swing, chipping, putting, bunker, special shots, equipment, tournament play, mental, physical fitness, tournament psychology, diet etc. throughout the year. Interested may contact Manjit Kochar (981-555-4788). Many of the senior Indian players have been signed up by WSH to play in the league, which has promised them hefty pay packets. The multi-city franchise-based league is scheduled to be held from December 17 till January 22 and will involve 61 matches. Around 200 players are being allocated to the teams based on the internationally-accepted and practiced ‘draft’ system”. The inaugural edition will comprise eight teams from Mumbai, Delhi, Chennai, Hyderabad, Bangalore, Chandigarh, Pune, Bhopal, Punjab, Ranchi and Rourkela. In a letter to Sports Ministry Under-Secretary, Shankar Lal, the SAI Project Officer (TEAMS), Rajpal, had stated, “after going through the opinions of Michel Nobbs, foreign coach, and David Jones, exercise physiologist, in detail, it is found that all the national hockey players attending the national coaching camp under OPEX 2012 (Operation Olympics), for the preparation of the national team for the Olympic qualifiers, have to practice and play together over the next two months with top-level players of the world for the purpose to qualify for the forthcoming Olympics 2012 (London), rather than playing in the WSH Tournament, where only the veteran class players will be participating. “Accordingly, it is proposed that, in order to concentrate on the preparation for the Olympic qualifiers as well as the Olympics 2012, we may not send the players who are undergoing coaching camp under OPEX 2012 for playing in the WSH Tournament,” the letter added. For good measure, it noted that it as “issued with the approval of the competent authority”, which infers the consent of both SAI Director-General Desh Deepak Verma and Sports Minister Ajay Maken. India are slated to hold the 2012 men’s and women’s Olympic qualifiers in Delhi in February-March, the 2013 men’s and women’s Junior World Cup, the 2013 final of the Men’s World League and the 2014 World Champions Trophy tournaments. But the International Hockey Federation (FIH) will allow India to hold these tournament subject to the condition that the Sports Ministry recognises Hockey India as the sole controlling authority of hockey for both men and women under its guidelines “as the National Sports Federation with complete and exclusive authority to govern men’s and women’s hockey in India, in respect of both national competitions and Indian participation in international competitions”. It also wants the Government to ensure that HI and FIH will not proceed with the implementation of the arrangement arrived at on July 25 to work together. Another clause, which makes it very difficult for the Government to support the IHF in any manner, is that “the Government will not fund or otherwise support any hockey event which is not sanctioned by the FIH and/or Hockey India”. This also means that the WSH will not get access to the SAI/Government-controlled hockey stadiums in the country for hosting the league. Meanwhile, disregarding the latest development, the WSH is going ahead with its signing spree of both Indian and foreign players. It has taken on board players such as Brent Livermore, Joseph Reardon, Peter Kelly, Robert Green and Mathew Philipps from Australia, Casey Henwood and Lloyd Stephenson (New Zealand), Jiwa Mohan (Malaysia) and Sung Min (South Korea). It said the recruits from Australia included Olympic and World Cup winners and a host of current players who have played close to 1000 international matches among them. Some of the Indian stars who have been roped in include current national players like Rajpal Singh, Sandeep Singh, Adrian D’Souza, Sardara Singh, Prabhjot Singh, Arjun Halappa, Diwakar Ram, Bharat Chetri, Dhananjay Mahadik, Shivendra Singh, Mandeep Antil, S.V. Sunil, Roshan Minz, William Xalxo, Prabodh Tirkey and Yuvraj Walmiki. Australia were 143 for four at tea with Clarke on 74 not out. They crashed to 40 for three after being sent in to bat before Clarke was the dominant partner in a fourth wicket stand of 103 with Shaun Marsh (44). Fast bowler Dale Steyn claimed the wickets of Shane Watson and Ricky Ponting, while new cap Vernon Philander had Phil Hughes caught behind as Australia struggled in seam friendly conditions after rain delayed the start by almost two hours.